Do you want to know How to Make Homemade Sun-Dried Cherry Tomatoes? 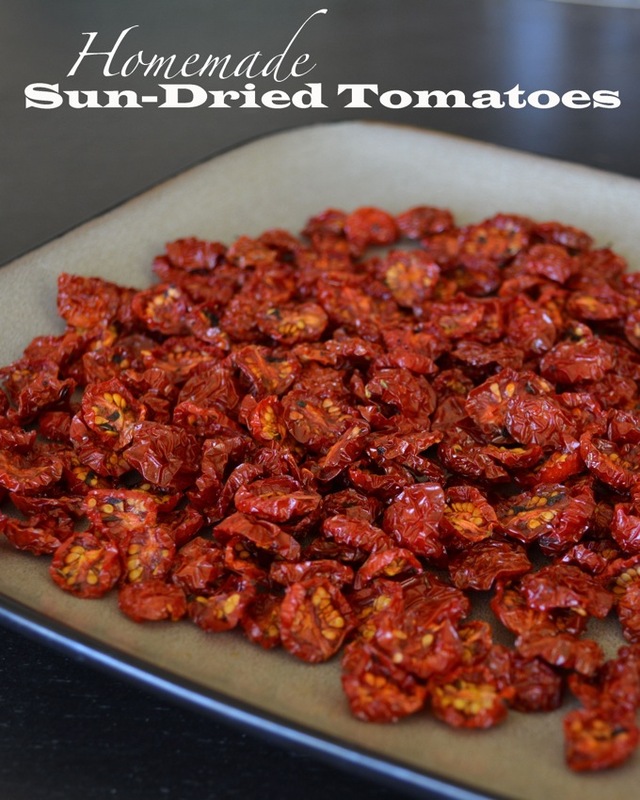 Homemade “Sun”-Dried Tomatoes are easy to make in your dehydrator. It’s a great way to use up all your summer cherry tomatoes, so you can have a taste of summer all year round! Tomatoes, tomatoes and more tomatoes. I have tomatoes coming out my ears! More tomatoes than we can eat, give away and make into sauce for the freezer. So I thought… how else can I preserve these summer beauties? How about drying them out?! The tomatoes took a lot longer than I thought they would, but they were totally worth the wait. They are so flavorful and delicious. They’re like little tomato raisins and I’ve been popping them like candy. Though the tomatoes are great on their own, they’re also awesome for cooking with! You are definitely going to want to try this Sun-Dried Tomato and Basil Pasta! Re-hydrating the tomatoes in a creamy sauce with fresh garden basil was pretty much amazing. I used cherry tomatoes because I had soooo many of them and they aren’t good for making sauce (too much skin and seeds)– but you could pretty much use any kind of tomato here. If I used something bigger, I would probably de-seed them. The cherry tomatoes really came out great though because they’re so sweet, and dehydrating the tomatoes makes the flavor extra concentrated and delicious. Plus the prep is really easy– just halve them! And place them cut-side up on the racks of your dehydrator. Easy peasy! The tomatoes may take up to 12 hours to dry out, depending on your dehydrator, but they are oh-so worth the wait. For something that many people think of as a vegetable, these little babies taste like candy. Now it’s time to eat them! Enjoy as is, sprinkled on salads, tossed in pastas, blitzed into pesto… the possibilities are endless! 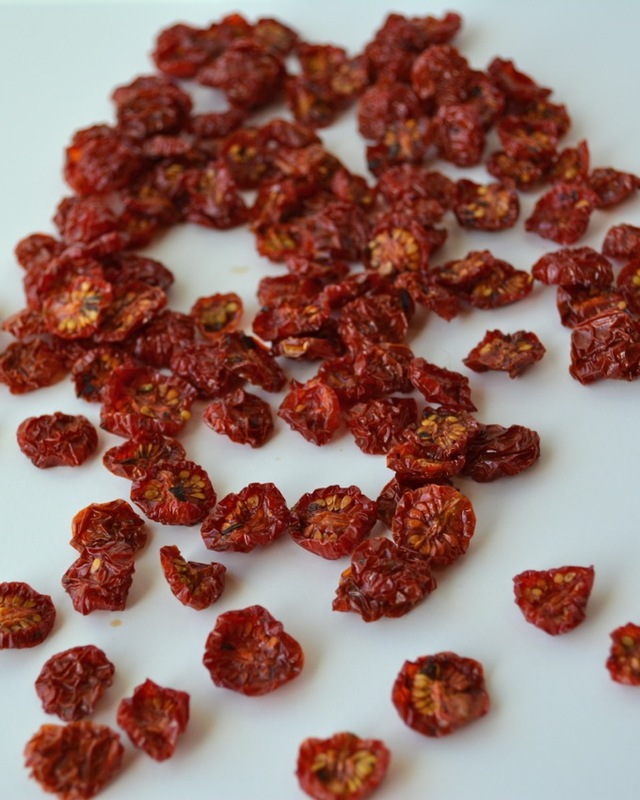 Homemade "Sun"-Dried Tomatoes are easy to make in your dehydrator. It's a great way to use up all your summer cherry tomatoes, so you can have a taste of summer all year round! 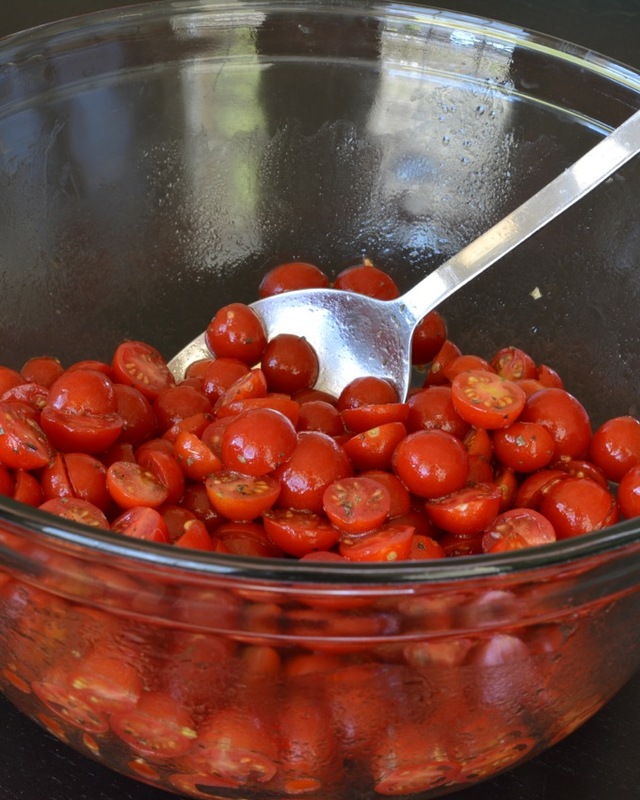 In a large bowl, toss halved cherry tomatoes with olive oil, salt and herbs. Place cherry tomatoes cut-side up on the racks of your dehydrator. Turn on the dehydrator (mine does not have heat settings, but if yours does, set it to 135-140 degrees). Flip the tomatoes after 5 hours and continue checking them every couple hours after that. Depending on the temperature and efficiency of your dehydrator and the water content of your tomatoes, it may take 6 to 12 hours to completely dry your tomatoes. 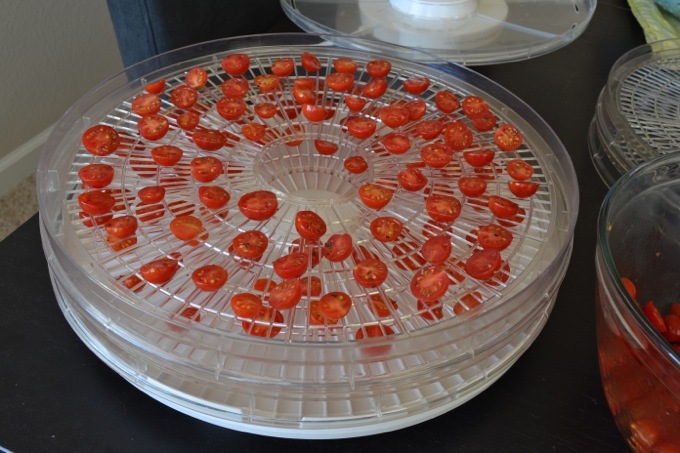 Leave the tomatoes in the dehydrator until they are completely dry. Remove, let cool completely, and store in an airtight container at room temperature. You might also want to check out this Sun-Dried Tomato Pesto that I made with a bunch of my tomatoes. It’s perfect for gifting to neighbors and friends! What’s your favorite way to eat sun-dried tomatoes? Any recipe suggestions for me? Have you ever made dried fruits or veggies? Oh man, now I’m wishing I’d planted some tomatoes this year, I am just so jinxed with tomatoes! These look delicious, Jess! Last year I added a fish head, aspirin, egg shells, epsom salt, and hair into a 3 foot hole then added a foot of soil over that and then added my plants. WOW…they reached 15 feet tall. You want to bury your tomato plant up to its top set of leaves. My plants were around a foot tall at the time of transplant. Remember to NOT over water. One magic mountain plant gave me over 300 tomatoes. We have also done straw bale gardening for the last 2 years and that is AMAZING! Wow, that sound’s like a crazy witch’s brew!! 🙂 I have definitely heard egg shells and asprin before… I will have to try that next year! Nothing like adding pharmacutical chemicals into your soil, healthy living thru chemistry I guess! What a great tutorial and recipe, Jess! I’ve only bought sun-dried tomatoes, so I’m loving this recipe! Definitely a time and money-saver…not to mention these look delicious! i’ve never thought of making my own sun-dried tomatoes before.. i definitely will stop being lazy by using store bought tomatoes and take the time to make my own instead. thanks for sharing a great recipe + for the inspiration! This is such a great idea! I’ve got to get myself a dehydrator. My sister has a fig tree, and this time of year she has SO many figs she can’t go thru them fast enough. So she dehydrates them and they’re so yummy in salads or with cheese. Why did I never think to do the same with tomatoes? Duh! PS – I want to know more about you making your own jerky! The next time Nick goes hunting, you must do a post in it! Ahhhh so jealous of figs!! Fresh figs are my fave! I’m so jealous of all your tomatoes! I have three plants and they are making just enough for me to make salads with, but not much more. I love sun dried cherry tomatoes, but they are always so expensive! I bought a food dehydrater last year, but still haven’t used it yet. I might just have to go and buy a bunch of cherry tomatoes just so I can make these sun dried tomatoes! Definitely in pasta… I’ve been keeping my eye out for a good recipe. I’ve seen a lot of sun-dried tomato pestos, so I was thinking about that too! These sun dried tomatoes look awesome! My favorite meatloaf recipe has sun dried tomatoes and you’re making me wish I had some on hand. They add such such a unique flavor! I’m also wishing I had a dehydrator! I just started a dehydrator full of tomatoes!! So excited. Do I just store them in an air tight jar or do I need to cover with olive oil? Hi Jennifer! I just store them in an airtight container. They won’t last as long as store bought since there are no preservatives but I have kept them at room temp for 3 weeks with no issue. Longer than that you might want to store in the fridge. I just started a dehydrator full of tomatoes!!! So excited!!!!!! How do I store them when finished? In an air tight jar or a jar filled with olive oil? these smell so good! Still a ways to go! Hooray! They do make the house smell SO good! once they are done how do you store them? Hi Suzy! I store them in tupperware containers, you could also use ziplocks. I keep them in my pantry and I’ve kept them for several months in there and they’re still good!